Easter Island has long been the subject of curiosity and speculation. How and why did its inhabitants carve and transport the massive statues which surround the island? What remains of this culture today, and what lessons can we learn from their legacy? This page is a resource for information on the Internet about Easter Island, also known as "Rapa Nui" and "Isla de Pascua". There has been much controversy and confusion concerning the origins of the Easter Islanders. Thor Heyerdahl proposed that the people who built the statues were of Peruvian descent, due to a similarity between Rapa Nui and Incan stonework. Some have suggested that Easter Island is the remnant of a lost continent, or the result of an extra-terrestrial influence . Archaeological evidence, however, indicates discovery of the island by Polynesians at about 400 AD - led, according to legend, by Hotu Matua. Upon their arrival, an impressive and enigmatic culture began to develop. In addition to the statues, the islanders possessed the Rongorongo script; the only written language in Oceania. The island is also home to many petroglyphs (rock carvings), as well as traditional wood carvings, tapa (barkcloth) crafts, tattooing, string figures, dance and music. 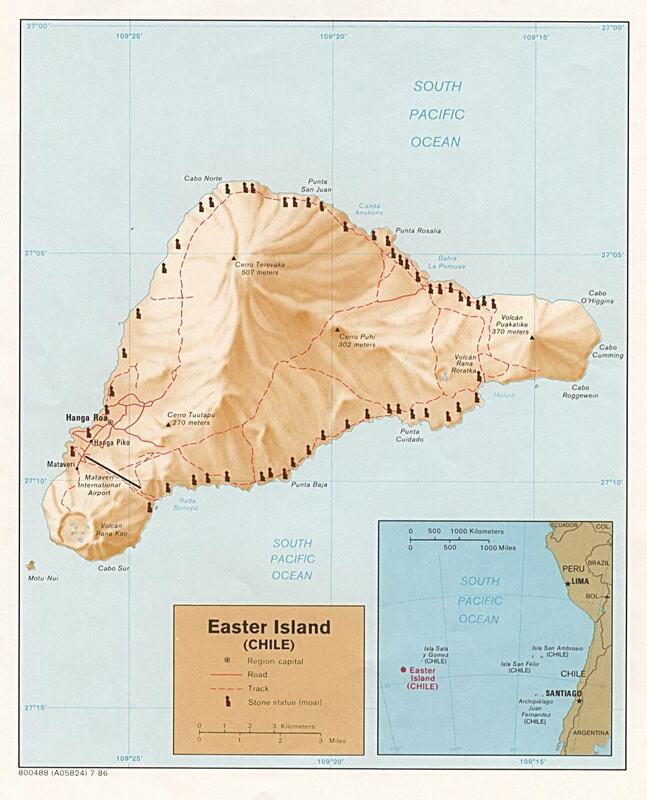 The population of Easter Island reached its peak at perhaps more than 10,000, far exceeding the capabilities of the small island's ecosystem. Resources became scarce, and the once lush palm forests were destroyed - cleared for agriculture and moving the massive stone Moai. In this regard, Easter Island has become, for many, a metaphor for ecological disaster. Thereafter, a thriving and advanced social order began to decline into bloody civil war and, evidently, cannibalism. Eventually, all of the Moai standing along the coast were torn down by the islanders themselves. All of the statues now erected around the island are the result of recent archaeological efforts. Contacts with western "civilization" proved even more disastrous for the island population which, through slavery and disease, had decreased to approximately 111 by the turn of the century. Following the annexation by Chile in 1888, however, it has risen to more than 2,000, with other Rapanui living in Chile, Tahiti and North America. Despite a growing Chilean presence, the island's Polynesian identity is still quite strong . Easter Island today, remains one of the most unique places you will ever encounter; an open air museum showcasing a fascinating, but unfortunately lost, culture. The Rapanui are among the friendliest people you will ever meet, and the landscape is truly amazing - with its volcanic craters, lava formations, beaches, brilliant blue water, and archaeological sites . Lan Chile flies to Easter Island, with flights operating between Santiago, Chile and Papeete, Tahiti. Airfare from Santiago, Chile to Easter Island and back costs approximately $800 US. There are several companies who can arrange package trips, including hotels, tours etc., but it is possible, and much cheaper, to arrange a place to stay upon arrival. Many locals who operate hotels and guesthouses arrive at Mataveri Airport to greet the tourists, and is something you might consider. Staying in a private home is a great way to meet the islanders and experience the local culture; however, one should use judgment in choosing accommodations, as not all places are of equal quality. Notably, the tourism on Easter Island is run entirely by the Rapanui themselves. In late January to early February the islanders celebrate Tapati, a festival honoring the Polynesian cultural heritage of the island. Far Horizons Archaeological and Cultural Tours organizes tours to the festival. For those interested in present-day Rapa Nui, an invaluable resource is the "Uncommon Guide to Easter Island" - available from the Easter Island Foundation, which also publishes the Rapa Nui Journal - the premier source for Easter Island events and scientific studies. Contact RNJ through: Georgia Lee Ph.D. Highly recommended if you are planning a trip to the Island are: Moon Publications' "South Pacific Handbook" by David Stanley, or Chile and Easter Island - Travel Survival Kit by Wayne Bernhardson - published by Lonely Planet.